Active Schools offers cycle training to all City of Edinburgh Council Primary Schools in the city. The role of the Active Schools Co-ordinators is to train the volunteers who run 'Bikeability' in schools. Supported Cycling Scotland who provide resource packs for each school, delivery is either playground or road based - normally a combination of the two - over a 6-week period. 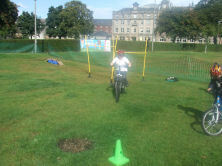 P6 and P7s are targeted, but other resources such as Ready Steady Bike are also used to help train the younger years e.g. P4-5. Cycle training gives children the skills and confidence required when learning to ride a bike, and encourages safe, active travel which supports their daily recommendation of 60 minutes of physical activity per day. Please email the Road Safety Officers at The City of Edinburgh Council for more information.